As I have mentioned in one of my previous post, to place the 3D camera onto a mechanical stabiliser based on counter-weigth principle was not such a good solution. At least I have proved myself that resulting 3D video looks great and I was good to go for some radical improvement. When I was in Chernobyl in autumn 2016 there were two film-makers from Slovakia with me on the tour. And I fell in love...not in one of them, but in the equipment they were using - DJI Ronin. An electronic stabilizer which can handle a DSLR camera. I was really amazed with the machine, how smoothly it was handling the (quite heavy) device. I was also amazed by price - but unpleasant way. You can search for the actual one. If I just compared it with the price I had bought my used car...guess what was cheaper. So after returning back from Chernobyl I spent few weeks by searching the best value solution for my purposes. Small (and cheap) stabilizers for action cameras or for mobile phones were too weak for my usage. DJI Ronin would be great but the price for me was crazy. But I have found a perfect one - Feiyu Tech MG v2 Lite. It was more than twice cheaper than Ronin and still it can handle load of 1.7 kg which is far enough for my 3D camera. I am actually very satisfied with that product. It is very well manufactured and you can feel the quality - made from aluminium and after proper setting and calibration it works just great. Since I was pretty annoyed of adjusting the camera distance in field by the 1/4 screews always when I was changing my location between indoor and outdoor, I needed to completely rebuild the camera rig. I wanted something which I could adjust very easily without releasing any screws. I have found it in an universal modular system based on 15 mm (Ø) rods - you can search for all possible parts on eBay, be creative and make almost anything you want from it. The final rig is very solid and quite heavy, but due to the allowed load of the stabilizer it doesn't matter. You can see the final result at the attached photos. Also you can notice that I have already changed the cameras. Previous Xiaomi Yi were replaced by another cheap chinese product - ThiEye T5e. The main reason was of course about much better performance. Xiaomi Yi can shoot in FullHD resolution only (1920 x 1080 px) and 29,97 frames per second. Of course it is not bad, but I wanted to have the possibility to record in 4k resolution (3840 x 2160 px). 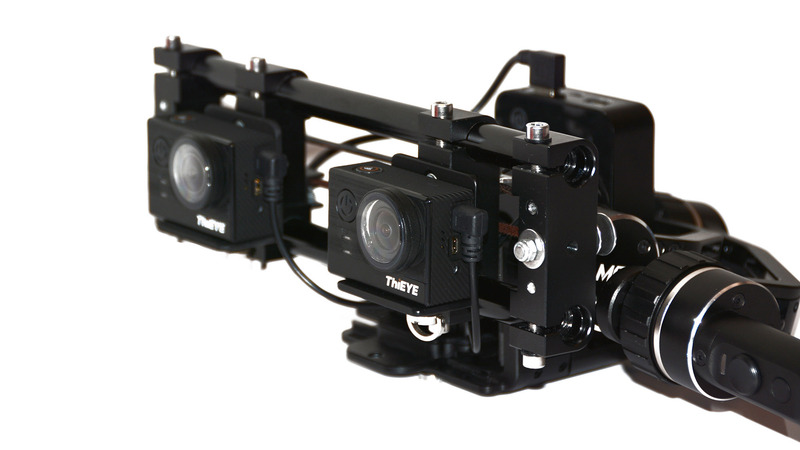 ThiEye is capable of that resolution in 29,97 fps. Plus it can record 59,97 fps in 2k resolution (2560 x 1440 px). Actually, that was the main reason for buying it. Since I can allow to shoot more dynamically with the electronic stabilizer, 60 fps always provides me the perfect image, not blurred by camera movement. And generally I am very satisfied with this action cam. I have installed a modified firmware from DashCamTalk's user Falsificator and the videos are...WOW! He increased bitrate of all the video formats and they look just amazing. Really. And in the end one valuable advice. Do not use the lens caps you can see on the photos. They are real crap. I have bought it as a lens cover for SJcam on eBay and it really fits on ThiEye, but the glass is wavy. Especially the long distances were very distorted and I was thinking that both my cameras are out of focus. Well, they were not...the image became absolutely perfect after removing those caps.